When was the last time you hired a professional heating company to inspect your furnace? As a local Cleveland heating company, we know that a heating system is an integral part of your home or business, meeting high demands for indoor comfort, reliability, and efficiency. There's never a good time for disruptions, delays, or poor performance. When you invest in superior heating solutions from the NATE-certified technicians at W.F. Hann & Sons, you enjoy greater rewards: Lower cost of operation, more precision control, extended service life, healthier air quality, and more consistent warmth. As a Carrier Factory Authorized Dealer, we offer a wide range of quality heating products and services, customized to answer the challenges faced by home and business owners in Warrensville Heights and the surrounding areas of Cleveland and Shaker Heights. Whether you are in need of furnace installation, repairs, or maintenance, know that we personalize service to suit your exact requirements, delivering affordable, satisfying, and lasting solutions. Contact the professionals from W.F. Hann & Sons and expect timely, courteous, and expert workmanship. For prompt response, expert service, and reliable solutions to your cooling needs, trust W.F. 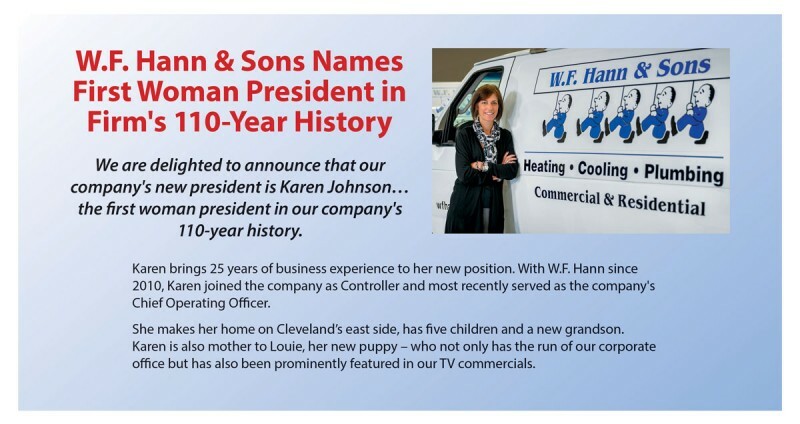 Hann & Sons, a Cleveland AC company. Whether you are in need of air conditioner installation, maintenance, or repairs, we combine state-of-the-art products with highly trained technicians to complete your project quickly and to exacting demands. 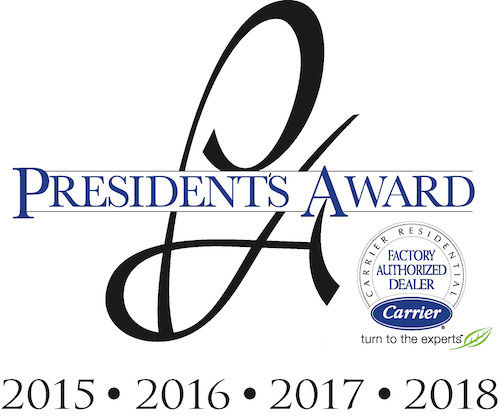 Distinguished as a Carrier Factory Authorized Dealer, W.F. Hann & Sons is held to strict criteria for service practices and procedures, licensing, insurance, and technical training. Our team of NATE-certified technicians have the extensive in-field experience and product familiarity to answer the challenge of local weather in and around Cleveland, Ohio, and help you achieve your goals for cost and comfort. Customized design/build, accurate retrofits, 24/7 Emergency Service, and convenient seasonal maintenance protect your investment and maximize return. When you trust your air conditioner to W.F. Hann & Sons, we put precision control of your temperature at your fingertips, optimizing the performance of your cooling system and creating a cleaner, healthier, and more enjoyable living and working environment. You depend on a fresh, clean, and amply supply of water. Whether you're confronted by an unforeseen disruption, your needs are not being met, or you're looking for proactive service, contact the professionals from W.F. 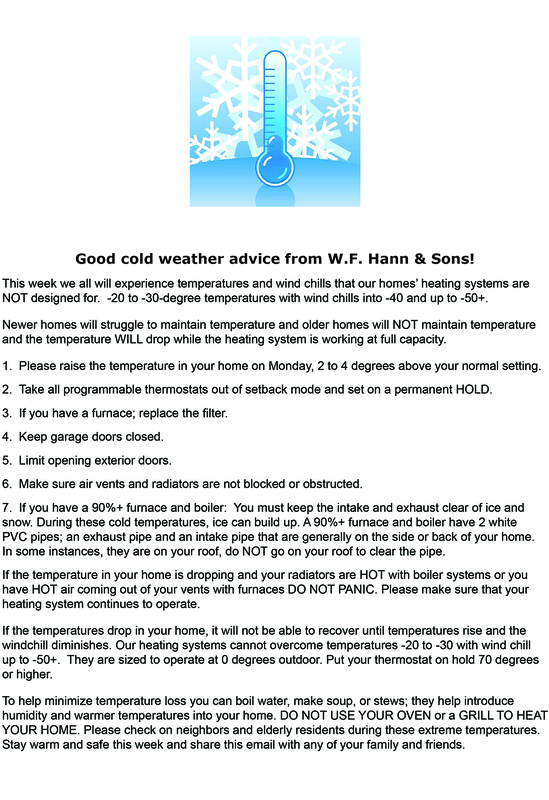 Hann & Sons for affordable, knowledgeable, and dependable solutions. We specialize in all things plumbing related, from your pipes and faucets, to your drains and water heater. Our qualified technicians deliver prompt assistance, informed recommendations, and accurate workmanship. Because of the intense use, high demand, and great importance of every aspect of your plumbing system, you can't live with anything less than top-quality, perfectly-functioning, efficient products. When you trust your comfort and convenience to W.F. Hann & Sons, we put our extensive background to work for you, drawing from years of industry experience, and utilizing only proven reliable, state-of-the-art equipment and materials. Accurate installation, round-the-clock Emergency Service, and comprehensive maintenance protect your investment, budget, and home from needless waste, damage, and aggravation. Trust W.F. Hann & Sons with all of your plumbing needs. We deliver the results that improve your everyday life. The qualified team at W.F. 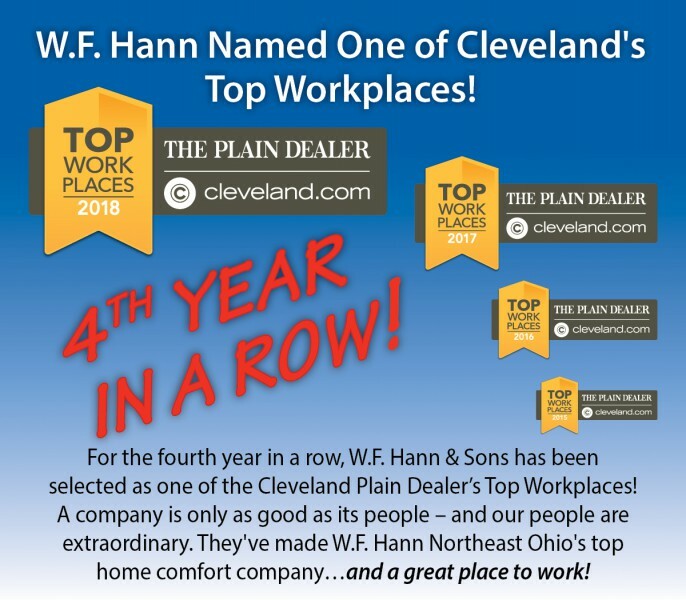 Hann & Sons is more than ready to tackle all your commercial heating and cooling needs throughout Cleveland, Pepper Pike, Chagrin Falls, Highland Heights, Beachwood, Shaker Heights, Lyndhurst, Willoughby Hills and University Heights, OH. Whether you need an installation, maintenance, or repair, we have the knowledge, dedication, and experience to get you to optimum comfort quickly and reliably. With superior Carrier products and an expertise that goes above and beyond, we know you’ll be satisfied with our HVAC services for many years to come. To ensure your building is kept completely comfortable and your heating and air conditioning systems are operating efficiently, contact our NATE-certified technicians today! Free Estimates on Heating & AC Installation! At W.F. Hann & Sons, we pride ourselves on providing our customers with superior service and knowledge. That’s why our trustworthy, experienced team provides free detailed estimates on heating and cooling unit upgrades and replacements. We’ll never try to sell you something you don’t need, and we will always be there from start to finish, as well as after your installation is completed for regular maintenance. Contact our friendly team today to get a reliable estimate! Welcome to W.F. Hann & Sons! For new installation and upgrades, prompt maintenance or repairs in Cleveland, Pepper Pike, Chagrin Falls, Highland Heights, Beachwood, Shaker Heights, Lyndhurst, Willoughby Hills and University Heights, OH, have confidence that W.F. Hann & Sons will satisfy your requirements and highest expectations. By focusing on quality, we bring you HVAC products, services, and results you can trust to withstand weather, use, and time. We recognize the importance of not only reliable solutions, but cost-effective implementation and operation. Our conscientious heating, air conditioning and plumbing services are not limited to regular business hours, but provides you with a dependable network of support round-the-clock in the Cleveland area. When your comfort, safety, or property are at stake, waiting for Monday, delayed arrival times, or difficulties with scheduling are unacceptable. Whether you contact the professionals from W.F. Hann & Sons to set up a service call or take advantage of our 24/7 Emergency Service, expect helpful assistance, prompt response, and personalized attention. We respect your busy lifestyle, and work diligently to minimize disruption and downtime, completing all jobs quickly and in an organized manner. 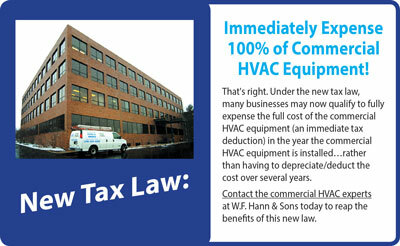 Our team of fully licensed and insured HVAC specialists take great pride in our company wide dedication to excellence. Upholding a tradition that began in 1907, W.F. Hann & Sons continues to focus on the important details that set us apart from our competitors. When it comes to service procedures, business practices, products, materials, and every facet of customer satisfaction, we don’t cut corners. Our quality-first approach ensures that your W.F. Hann & Sons technician will arrive on time, dressed in company uniform, with identification. We safeguard your home and property through the use of shoe covers and drop cloths, maintain a tidy work area, and reclaim all old equipment and debris for proper disposal. Our fleet of fully-stocked service trucks and highly skilled contractors allow us to complete the majority of repair needs in a single visit. Heating and AC installation from a professional HVAC contractor! When you schedule installation with W.F. 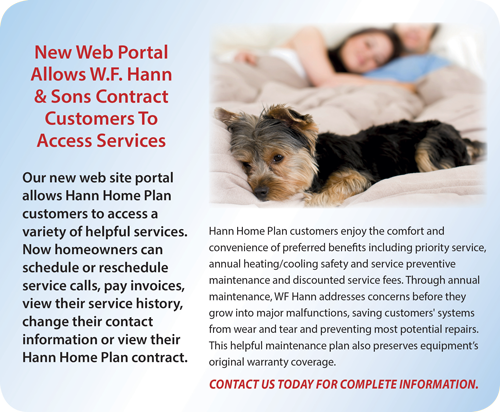 Hann & Sons, whether your project involves air conditioning, furnace, boiler, ductless mini split, water heater, or plumbing installation, we provide an accurate date of completion that you can depend on. Detailed written proposals and upfront pricing eliminate confusion and unpleasant surprises. We adhere to all state and local codes, and uphold strict standards of safety, workmanship, and performance. 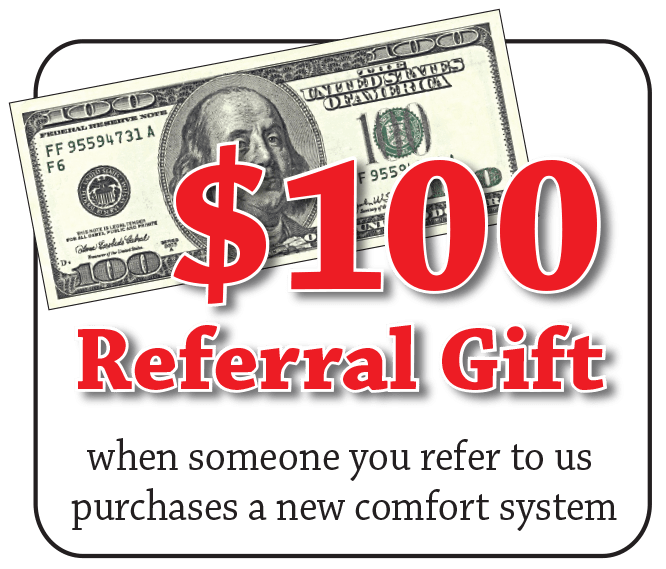 Our NATE-certified HVAC technicians make absolutely sure that your new heating and cooling system is functioning properly, and that you are comfortable with operation and features. With the W.F. Hann & Sons Quality Assurance Guarantee, every job is inspected by a senior staff member to verify our high standards and fulfill your 100% satisfaction. To allow for ease of investment in quality solutions to your heating, cooling, and plumbing needs, we offer helpful financing with fast, easy approval, low monthly payments, convenient payment options, and competitive interest rates. Through ground-breaking technology, precision workmanship, and extensive in-field experience, we help you improve efficiency, air quality, functionality, and convenience throughout your home or commercial facility. Have confidence that when you contact W.F. Hann & Sons, your goals will be met.